The government has unveiled details of its National Infrastructure Plan - which, predictably, involves selling off more of the family silver. The government has given us more pre-Autumn Statement info about how it plans to save its pennies, with an update to the National Infrastructure Plan. 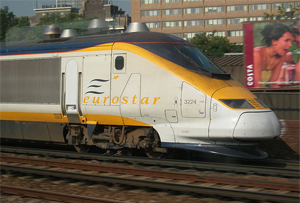 The Treasury (and whatever private sector partners it can persuade to join in) will cough up £375bn for utilities and transport projects over the next two decades – but to do that, it needs to sell off Eurostar. Sacre bleu. Included in its list of pet projects are the £1bn extension to London’s Northern line and the notorious HS2 (as opposed to B. I. G.) project, as well as a £50m upgrade to Gatwick’s railway station and a guarantee for a new nuclear power station on Angelsey which will, it hopes, encourage financial backers. Obviously, to do that the government is going to have to find some cash (although spending is coming down, let’s not forget that public debt is currently 75.4% of GDP – almost the highest it’s ever been) – so it’s decided to flog its 40% stake in Eurostar. It makes sense: in September the company posted results showing sales revenue in the three months from July had hit £207m, a 10% increase on the same period last year. At the same time, passenger numbers rose 5% to 2.7 million. Possible buyers include German rail operator Deutsche Bahn and French operator SNCF, which owns the other half of Eurostar. If the French do buy it, presumably we'll see an increase in the quality of croissants and coffee - if not punctuality. George Osborne clearly hasn’t been put off by the hoo-hah over Royal Mail’s privatisation. Apparently he wants to sell £20bn of the government’s financial and corporate assets by 2020, including the student loan book and various sites owned by London & Continental Railways, the state-owned railway company. Ramblers' favourite Ordnance Survey is another possibility. Treasury Minister Danny Alexander denied this morning that Companies House and the Royal Mint – both, in property industry parlance, ‘nice bits of kit’ – were on the list, although he added that no decisions have been taken. ‘If it can be better run in the private sector, there’s no reason why we can’t get the receipts in and reinvest. It is right that we look at all the assets we own,’ he told the BBC. On top of all this, six of the UK’s largest insurance companies – Legal & General, Prudential, Aviva, Standard Life, Friends Life and Scottish Widows – have pledged to invest £25bn into the UK’s infrastructure. We don’t have any details about exactly which projects they’ll be involved in, but Alexander reckons this is a ‘major vote of confidence’ from the City. Perhaps. A previous attempt at trying to wring cash out of pension funds, known as the Pensions Infrastructure Platform, has so far only managed to persuade institutions to part with £1bn of cash, out of the £20bn it had hoped for. And look at the government’s frequent, flaccid attempts at trying to get pension funds to pay for housing: after several years of wheedling by the government, the institution-funded private rented sector we keep being promised is only just lurching into life. Still, today’s announcement suggests that in the three years since the NIP was published in October 2010, things have got off to a reasonably promising start. The original plan outlined 646 projects, of which 291 have now been completed. According to a ‘delivery update’ published in April, that includes an upgrade to London Underground’s Victoria line and a wireless urban broadband link between Leeds and Bradford. Still under construction are Crossrail, the £14bn railway line across London; the replacement Terminal 2 at Heathrow and the London Gateway, a £400m deep-sea container port in the Thames. MT can’t help but notice that, geographically speaking, it’s a bit bottom-heavy. Looks like the next two decades will stay grim oop north.